Several million chemical compounds are known, but with 118 chemical elements the number of compounds that are stable and could be synthesized is potentially much larger. The Workshop focuses on recent developments in the prediction of crystal structures by computational methods. Thanks to enormous progresses in computational power and in algorithm development, we are now closer to the possibility to predict the structure of a material from the simple knowledge of its composition. This Workshop will be dedicated to presenting and discussing the algorithms for in-silico crystal structure prediction that were developed in the last years, focusing in particular on the approaches based on molecular modeling. 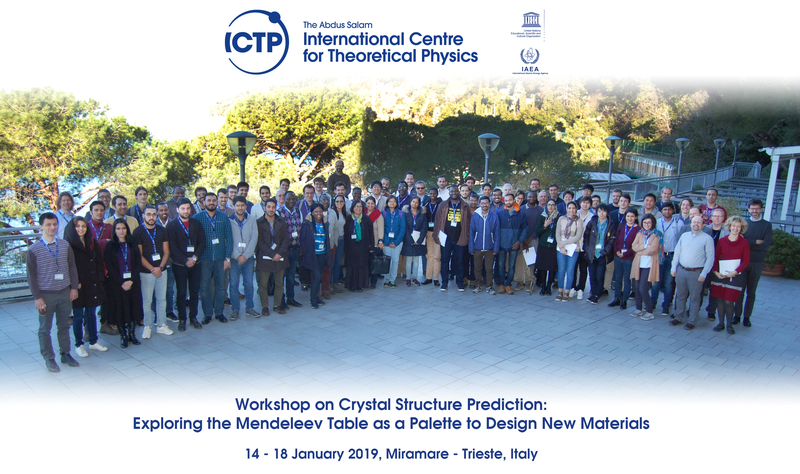 We find particularly appropriate holding this conference in 2019, the International Year of the Periodic Table, since crystal structure prediction is rooted in a deep knowledge of the properties of the atoms. The Workshop will be divided into two parts: the first 3 days will be dedicated to an advanced discussion of the latest advances in the field and last 2 days will be dedicated to hands-on tutorials with structure prediction methods in combination with electronic structure and atomistic methods. A Poster Session will also be organized, and interested candidates are invited to upload a short abstract of their proposed posters during the application process (max. half page, in pdf format). Poster presentation is not mandatory, however participants are encouraged to present their results.